Kyle McBrien had just stepped away to use the bathroom. By the time he returned, his 2-year-old daughter was in need of surgery. 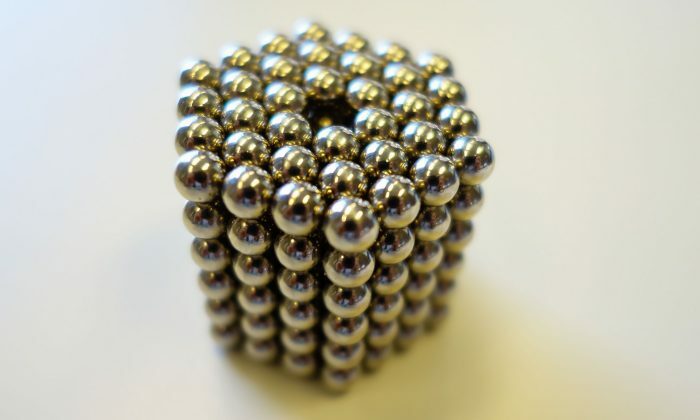 McBrien had on his desk a collection of Buckyballs—small, strong, ball-shaped magnets. When he returned from bathroom, he saw his daughter, Ella, with some of the magnets in hand. He knew she likes to put things in her mouth and so was worried she might have swallowed some. Doctors at Children’s Hospital Colorado took x-rays of Ella and saw she had indeed swallowed 28 of the tiny magnets, which had linked together in her intestines to form a circle. Two magnets had pinched the side of her bowel and were in process of forming a hole, said Dr. Robert Kramer, Co-medical Director of the Digestive Health Institute and the Director of Endoscopy at the hospital. The first procedure failed to retrieve the magnets. Kramer then used a specialized endoscopy and successfully removed them. Ella quickly recovered after the minor surgery. But in the past there have been many more serious cases where doctors have had to remove part of the intestine after the balls punctured the bowel. “In the worst cases there have been deaths associated with these,” said Kramer. There have been 2,900 ingestions of magnets that ended up in emergency rooms between 2009 and 2013, according to the Consumer Product Safety Commission. The agency implemented a ban on the magnets in 2012 and managed to get most distributors to stop selling them. But last year’s Tenth Circuit Court decision reversed the ban. Since then, injuries such as these have been back on the rise, Kramer said. “It sounds as benign as humanly possible—magnets, you don’t think anything of it,” said McBrien. “Clearly, they’re so small and very, very easy to be swallowed. So, therefore, there’s a very, very strong risk,” he told Fox News. The magnets are made of an alloy of neodymium, iron, and boron. They are usually 3-6 millimeters in diameter and are usually sold in sets of 125-224. They can be arranged into various shapes and sculptures.